The former Queensland State of Origin and Australian representative has been signed under the international player pathway program in the NFL. The contract will see Holmes play in all four pre-season games for the Jets, and then have a chance at cracking the 53-man squad. Reports suggested he wouldn’t be able to play in the regular season under the terms of his deal, however, according to the NFL, he will have a chance to compete for a spot through practice and pre-season games. If Holmes doesn’t make the 53-man squad, he will have a guaranteed spot on the Jets practice squad as an additional 11th player. 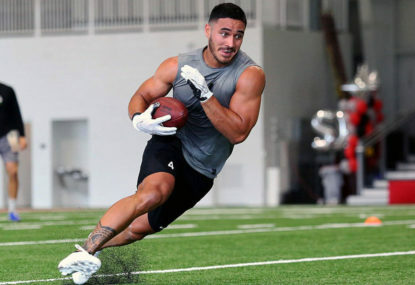 Official confirmation from the @nfl: Valentine Holmes is able to compete for a spot on Jets 53-man roster thru training camp & preseason, and can be active in regular season if he makes the 53. If not, has a guaranteed spot on the Jets Practice Squad as an additional 11th player. It could be said Holmes going down this path and not signing as a free agent shows his commitment to the cause, given he is unlikely to play regular season matches until at least 2020. He will spend the season learning from those around him, and then seek a full contract for the following season. According to the Jets official statement, Holmes will be listed as a running back, wide receiver and kick returner, and was only notified by a call from the general manager this morning, Australian time. Four teams signed up to the international player pathway program this season, with each side then receiving players in a random draw. The Buffalo Bills, Miami Dolphins and New England Patriots were the other teams allocated a player, with Holmes falling to the Jets as the last player announced. The other players respectively were former England national rugby player Christian Wade, Durval Neto and Jakob Johnson, while three others didn’t make the cut. Holmes is the second high-profile NRL player to make the switch to the NFL in the last few years, following in the footsteps of Jarryd Hayne. The 23-year-old left the NRL as one of the best in the game, having stamped his authority on the Cronulla Sharks fullback jumper, as well as establishing himself on the wing in both the Queensland and Australian teams. He finished seventh in the 2018 Dally M race and left a huge hole to fill at the Sharks. There had been reports in recent weeks Holmes was homesick and looking to sign with the North Queensland Cowboys, however there’s no chance of that happening anytime soon. Holmes reportedly impressed scouts with some impressive results at the international players combine last week, with his unofficial 40-yard dash time coming in at 4.45 seconds. That time came despite him having put on four kilograms since arriving in the USA. The NFL official pre-season games, which Holmes will play under his contract with the Jets, will commence in August. Official fixtures and dates are yet to be announced.